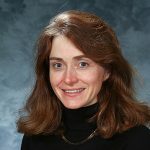 Pamela Propeck, MD, FACR, was recently appointed Chair of the American Board of Radiology (ABR) Breast OLA (Online Longitudinal Assessment) Committee. Dr. Propeck has served the ABR for years beginning as an examiner for breast when the oral exam was held in Louisville, Kentucky, continuing on the breast certifying committee after the oral board exam was discontinued, and finally serving as a senior reviewer on the OLA Committee. The OLA committee was started several years ago as a way to satisfy Part 3 of the Maintenance of Certification program for diagnostic radiology replacing the 10-year exam. The OLA committee consists of item writers who have been vetted by the ABR, as well as four senior reviewers and the committee chair. The goal is to have this material be representative of “walking around knowledge.” This committee’s job is to determine what is clinically relevant information and test and teach that information to ensure all radiologists have the knowledge needed to provide quality clinical care to their patients. Congratulations on this great honor, Dr. Propeck!